This is a story – or two stories – about three women and a man, going in different directions. A story of hope, and a story of despair. One of dreams dashed, one of butterflies in the stomach. A story of escape, and a story of imprisonment. It is about setting out on a new life full of soaring promise, and of returning to deep, bitter disappointment. I met the protagonists on the same day, an hour apart, in the cacophony and hubbub of Kathmandu, Nepal’s bustling, quirky capital. It was a grey day, the hills ringing the city barely visible in the dusty gloom; the glistening Himalayan peaks hidden in ominous monsoon clouds. 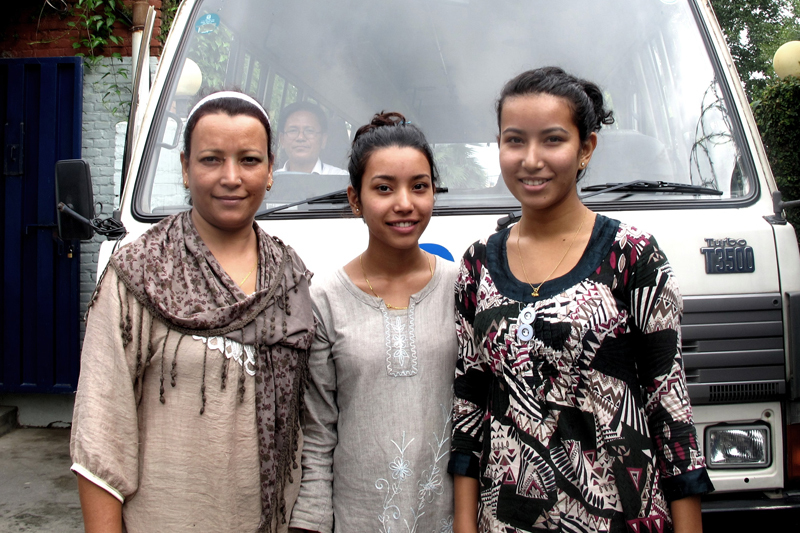 Suman Basnet (42) and her daughters Emma and Numa (17 and 19) were preparing to leave Nepal for the USA on the US Refugee Admissions Program, after almost two decades in a refugee camp. 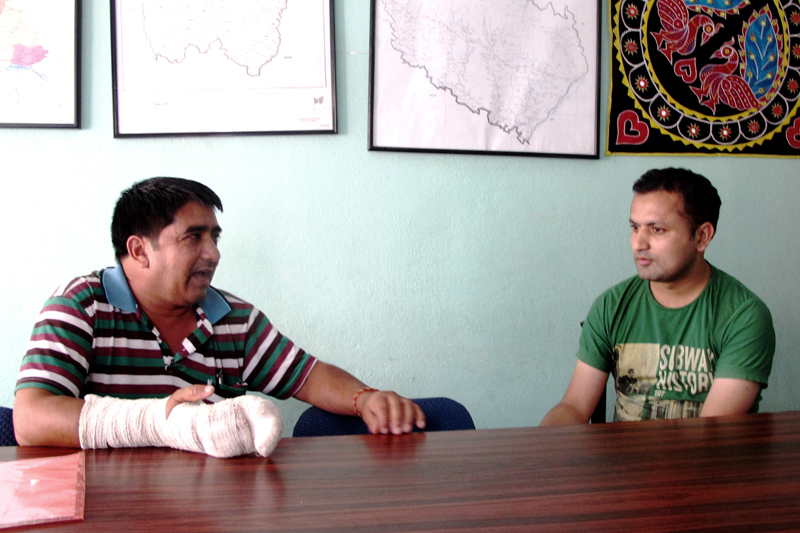 Across town, 40-year-old Tanka Batala was sitting in an overcrowded, stuffy reception room at an NGO office, his right hand swathed in bandages. Nepal is best known as the home of Mount Everest, but in recent years – since the end of the civil conflict – it has also become known as a source of cheap migrant labour. Over two million Nepalis now work overseas (hundreds of thousands work across the open border in India), and almost a quarter of the country’s GDP now comes from migrant remittances. In the 1990s, tens of thousands of ethnic Nepalese fled violence and persecution in neighbouring Bhutan. Almost 100,000 have been resettled by IOM, mainly to the USA, but also to Australia, Canada, Denmark, the Netherlands and Norway. Suman and her two daughters are bound for Los Angeles, where her cousin is already settled, running a beauty parlour. Their mood is buoyant, exhilarated, breathless. It contrasts heavily with that of Tanka. He thought he too was leaving for a better life, a few months in Malaysia, polishing furniture and getting it ready for sale. Instead, he ended up in a camp in the jungle for a year, working in a sawmill, duped, ripped off, arrested, imprisoned, and then “rescued” by his employer only to be sent back to the jungle, his salary withheld, until the day that his hand slipped and went under the blade, lopping off the top of three fingers. For Suman and her girls, the future seems brighter. They all speak excellent English, honed by years of teaching the language to fellow refugees in unofficial schools. The girls are full of chatter about LA, the studies they want to pursue, but the mother’s face, though smiling, betrays a deep sadness. Their plans for America are grounded in realism. “It’s not going to be easy. We will have to work hard,” says Suman. But you know, you just know when you hear them talk and you see their faces, that they are going to be OK. They have been waiting years for this, the day of departure. Their last staging post is the IOM transit centre in Kathmandu – the last link in a chain of self and guided preparation in everything from how to get a job to how to fasten an aeroplane safety belt. As for Tanka, all that is left is hope, which he clings to. He will get some small compensation for his injury, and the Migrants Rights Association (“For the Migrants, by the Migrants”, an IOM partner) will advocate for him, help him with his legal case and paperwork, and do what they can to help him reintegrate. But when he walks back into his own village, he’ll be seen as a failed migrant, just one of thousands who didn’t make it. Mass migration is set to be part of Nepal’s future for a considerable time, given the lack of jobs at home. Managing that will be key to the future of the country; central to its development and prosperity.